The American Social Progress Imperative ranked Slovenia 21st around the world regarding the quality of life. The ranking took into account such indicators as the standard of living, the level of education, medicine, access to technology, sanitation, freedom of speech, freedom of choice, tolerance, and the protection of human rights. 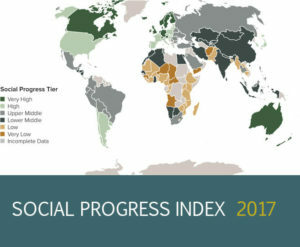 The calculation was carried out on a 100-point system and Slovenia in total scored 84.32 points entering the category of states with a high level of social progress. The top ten are the developed European countries: Denmark (90.57), Finland (90.53), Iceland (90.27), Norway (90.27), Switzerland (90.10), Canada (89.84), Netherlands (89.82), Sweden (89.66), Australia and New Zealand (89.30 points each). The United States occupies only the 18th place (86.43). Poland is 32nd (79.65), Ukraine—64th (68.35), Belarus—65th (67.80), and Russia—67th (67.17). In total, the ranking considered indicators of 128 countries around the world.